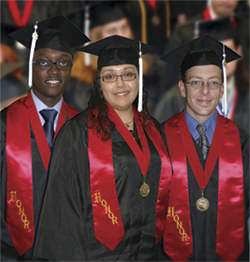 On graduation night, honors students walk across the stage wearing a gold stole over their black robes. Two students who have earned the right to wear those stoles say the extra effort is worth it. Both Lisa Shaw, a pre-law sophomore at OCCC, and Sarah Landon, a liberal arts and Spanish major who graduated OCCC in the spring of 2014, agree the honors program has challenged them to find that extra drive within themselves. They said the honors pro­gram not only gives students an opportunity to expand their knowledge in the classroom but also provides a plethora of benefits beyond graduation that otherwise would not be available to them. For Landon, working while taking classes at OCCC with the added requirement of earn­ing at least 15 hours of honors credit, posed a time manage­ment challenge. “I had to find ways to moti­vate myself,” she said. Students are not penalized for not completing honors projects, but they don’t receive honors credit in the class if they don’t. Landon said she had to dis­cipline herself to get the work done to earn 15 credits hours with honors. Shaw said what sets the OCCC honors program apart from others is that it is flexible. Honors students are allowed to make an honors contract in the classes of their choosing. The contract is made between the student, the professor and the honors program director. The three must all agree on the criteria of an honors project and that the project is worthy of receiving honors credit. Students who choose to take honors courses have the freedom to develop certain concepts in the class on a deeper level. For Shaw, this proved both challenging and rewarding. Shaw and Landon are confi­dent that the time put into their honors work will continue to reap benefits. “I believe my work in the honors program allowed me to receive the President’s Award for Excellence, as well as make me eligible for tuition waivers which have helped me save money towards a four-year degree,” Landon said. For students who are unsure about applying for the honors program, these two students have some advice. The coordinator of the hon­ors program is Professor Nina Smith, who teaches English as well. “Working with Professor Smith is a really strong mo­tivator if you need direction or motivation to take the first jump into honors,” Landon said. She said the most rewarding part of being in the honors program is the growth of the students as they go through this process. “She did her research about how three different sopranos interpreted that aria,” Smith said. Landon is currently a student at the University of Central Oklahoma and plans to gradu­ate with a double major in liberal studies and Spanish. Shaw will graduate from OCCC after this semester and is currently looking at the University of Oklahoma and Harvard law school. In order to apply for the hon­ors program, students must have either an unweighted GPA of 3.5 if they have completed fewer than 12 hours of college coursework, a 22 or higher composite ACT score, or a 3.5 cumulative GPA of college coursework if students have 12 or more credit hours. Additionally, students must have at least 30 remaining hours before their associate degree is completed. The application requires an essay explaining the reasons for applying and the abilities or characteristics that would make the student successful in the program. For more information, call Smith at 405-682-1611, ext. 7141, or at nsmith@occc.edu.